Tulare County (/tʊˈlɛəri/ tuu-LAIR-ee) is a county in the U.S. state of California. As of the 2010 census, the population was 442,179. Its county seat is Visalia. The county is named for Tulare Lake, once the largest freshwater lake west of the Great Lakes. Drained for agricultural development, the site is now in Kings County, which was created in 1893 from the western portion of the formerly larger Tulare County. Tulare County comprises the Visalia-Porterville, CA Metropolitan Statistical Area. The county is located south of Fresno, spanning from the San Joaquin Valley east to the Sierra Nevada. 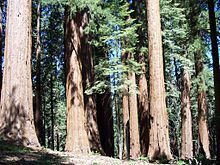 Sequoia National Park is located in the county, as are part of Kings Canyon National Park, in its northeast corner (shared with Fresno County), and part of Mount Whitney, on its eastern border (shared with Inyo County). As of the 2010 census, the population was 442,179, up from 368,021 at the 2000 census. The land was occupied for thousands of years by varying cultures of indigenous peoples. Beginning in the eighteenth century, Spain established missions to colonize California and convert the American Indians to Christianity. Comandante Pedro Fages, while hunting for deserters in the Central Valley in 1772, discovered a great lake surrounded by marshes and filled with rushes; he named it Los Tules (the tules). It is from this lake that the county derives its name. The root of the name Tulare is found in the Nahuatl word tullin, designating cattail or similar reeds. After Mexico achieved independence, it continued to rule California. After the Mexican Cession and the Treaty of Guadalupe Hidalgo in 1848, the area became part of the United States. Tulare County was soon formed from parts of Mariposa County only 4 years later in 1852. There were two early attempts to split off a new Buena Vista County in 1855, and Coso County in 1864, but both failed. Parts of the county's territory were given to Fresno County in 1856, to Kern County and to Inyo County in 1866 and to Kings County in 1893. The infectious disease Tularemia caused by the bacterium Francisella tularensis is named after Tulare County. In 1908 Colonel Allen Allensworth and associates founded Allensworth as a black farming community. They intended to develop a place where African Americans could thrive free of white discrimination. It was the only community in California founded, financed and governed by African Americans. While its first years were highly successful, the community encountered environmental problems from dropping water tables which eventually caused it to fail. Today the historic area is preserved as the Colonel Allensworth State Historic Park, which is listed on the National Register of Historic Places. According to the U.S. Census Bureau, the county has a total area of 4,839 square miles (12,530 km2), of which 4,824 square miles (12,490 km2) is land and 14 square miles (36 km2) (0.3%) is water. Sequoia National Park is a national park in the southern Sierra Nevada, east of Visalia. It was established in 1890 as the second U.S. national park, after Yellowstone. The park spans 404,051 acres (1,635.14 km2). Encompassing a vertical relief of nearly 13,000 feet (3,962 m), the park contains among its natural resources the highest point in the contiguous 48 United States, Mount Whitney, at 14,505 feet (4,421 m) above sea level. The park is south of and contiguous with Kings Canyon National Park; the two are administered by the National Park Service as one unit, called Sequoia and Kings Canyon National Parks. Tulare County is a general law county under the California Constitution. That is, it does not have a county charter. The county is governed by a five-member Board of Supervisors. Supervisors are elected by districts for four-year terms. There are no term limits in effect. The Chairman and Vice-Chairman are elected annually by the Board of Supervisors from among its members. The Tulare County Sheriff provides court protection, county jail operation, patrol and detective functions in the unincorporated areas of the county. Incorporated towns have municipal police departments or contract with the Sheriff for their police operations. Tulare County Transit provides a countywide bus service linking the population centers. A connection to Delano in Kern County is also operated. The cities of Tulare, Porterville, and Visalia have their own local bus services. Greyhound and Orange Belt Stages provide long-distance, intercity bus service. The Porterville Municipal Airport located 3 nautical miles from Downtown Porterville has very limited commercial passenger service with WestAir. The airport offers general aviation to the public, it is also home to Porterville Air Attack Base on the south part of the airport. The Visalia Municipal Airport is a city-owned airport for the city of Visalia, California. Mefford Field is a city-owned general aviation airport located in Tulare. The nearest full operation commercial airports are Bakersfield's Meadows Field Airport to the South, and Fresno's Fresno Yosemite International Airport to the North. The 2010 United States Census reported that Tulare County had a population of 442,179. The racial makeup of Tulare County was 265,618 (60.1%) White, 7,196 (1.6%) African American, 6,993 (1.6%) Native American, 15,176 (3.4%) Asian, 509 (0.1%) Pacific Islander, 128,263 (29.0%) from other races, and 18,424 (4.2%) from two or more races. There were 268,065 people (60.6%) of Hispanic or Latino origin, of any race. As of the census of 2000, there were 368,021 people, 110,385 households, and 87,093 families residing in the county. The population density was 76 people per square mile (29/km²). There were 119,639 housing units at an average density of 25 per square mile (10/km²). The racial makeup of the county was 58.1% White, 1.6% Black or African American, 1.6% Native American, 3.3% Asian, 0.1% Pacific Islander, 30.8% from other races, and 4.6% from two or more races. 50.8% of the population were Hispanic or Latino of any race. 6.2% were of American, 5.7% German and 5.0% English ancestry according to Census 2000. 56.3% spoke English, 38.9% Spanish and 1.1% Portuguese as their first language. There were 110,385 households out of which 44.9% had children under the age of 18 living with them, 58.1% were married couples living together, 14.5% had a female householder with no husband present, and 21.1% were non-families. 17.1% of all households were made up of individuals and 7.7% had someone living alone who was 65 years of age or older. The average household size was 3.28 and the average family size was 3.67. In the county, the population was spread out with 33.8% under the age of 18, 10.6% from 18 to 24, 27.6% from 25 to 44, 18.2% from 45 to 64, and 9.8% who were 65 years of age or older. The median age was 29 years. For every 100 females there were 100.0 males. For every 100 females age 18 and over, there were 97.7 males. The median income for a household in the county was $33,983, and the median income for a family was $36,297. Males had a median income of $30,892 versus $24,589 for females. The per capita income for the county was $14,006. About 18.8% of families and 23.9% of the population were below the poverty line, including 32.6% of those under age 18 and 10.5% of those age 65 or over. The United States Office of Management and Budget has designated Tulare County as the Visalia-Porterville, CA Metropolitan Statistical Area. The United States Census Bureau ranked the Visalia-Porterville, CA Metropolitan Statistical Area as the 111th most populous metropolitan statistical area of the United States as of July 1, 2012. The Office of Management and Budget has further designated the Visalia-Porterville, CA Metropolitan Statistical Area as a component of the more extensive Visalia-Porterville-Hanford, CA Combined Statistical Area, the 80th most populous combined statistical area and the 92nd most populous primary statistical area of the United States as of July 1, 2012. Tulare is a strongly Republican county in Presidential and congressional elections. The last Democratic candidate for President to win a majority in the county was Lyndon Johnson in 1964. California's 23rd congressional district, represented by Republican Kevin McCarthy. the 16th Senate District, represented by Republican Shannon Grove. In the California State Assembly, the county is split between the 23rd Assembly District, represented by Republican Jim Patterson, and the 26th Assembly District, represented by Republican Devon Mathis. The dairy industry, with sales of milk products, brings in the most revenue for the county, typically more than US$ 1 billion a year annually. Oranges, grapes, and cattle-related commodities also earn hundreds of millions of dollars annually. In 2001, Tulare became the most productive county in the U.S. in terms of agricultural revenues, at US$3.5 billion annually. It surpassed Fresno County's US$3.2 billion, which had held the top spot for over two decades. Due to the importance of agriculture in the county as well as its location in the state, since 1968 the city of Tulare has been the site of the annual World Ag Expo, the world's largest agricultural exposition. Minor league sports teams, such as the baseball Visalia Rawhide of the class-A level California League (an affiliate to the Arizona Diamondbacks), two teams of the Minor League Football Association in Tulare and Visalia, and four teams of the Central California Basketball League based in Porterville, attract many residents and add to the amenities in the county. The population ranking of the following table is based on the 2010 census of Tulare County. ^ "County Administrative Officer - CAO". County of Tulare. Retrieved February 8, 2015. ^ "Home - Board of Supervisors". County of Tulare. Retrieved March 24, 2017. ^ "Mount Whitney". Peakbagger.com. Retrieved February 9, 2015. ^ "city-data-Tulare_County-CA". analyzed data from numerous sources. Retrieved April 7, 2009. ^ Leip, David. "Dave Leip's Atlas of U.S. Presidential Elections". uselectionatlas.org. Retrieved September 6, 2018. ^ "California's 23rd Congressional District - Representatives & District Map". Civic Impulse, LLC. Retrieved September 25, 2014. Jennifer Medina, "With Dry Taps and Toilets, California Drought Turns Desperate," New York Times, Oct. 2, 2014. Wikimedia Commons has media related to Tulare County, California. This page was last edited on 19 April 2019, at 18:22 (UTC).